A new article outlines how the US can regain and extend its edge in sea combat, and do so on the cheap. One of my other publishing homes, the Naval Institute Proceedings, carries a sterling essay on "Sustaining American Maritime Influence" in its September issue. The title appears misleading at first blush. The article is less about naval diplomacy per se than about regaining and extending the U.S. Navy's edge in sea combat, and doing so on the cheap. A team of coauthors, including master tactician Wayne Hughes and Admiral John Harvey, a recently retired grand poobah of U.S. Fleet Forces Command, examines the part small, inexpensive, plentiful missile-armed combatants could play in U.S. maritime strategy, mainly in Asian waters. Their verdict: smaller is better. This is a favorite thesis for the Naval Diplomat. The basic idea comes from historian Julian S. Corbett, who lamented the way technological change upended naval warfare a century ago. During the age of sail, battle fleets had the luxury of concentrating on their offensive function. Hurling broadsides at enemy fleets was their sole purpose. Line-of-battle ships had little to fear from "cruisers," lightly armed vessels that controlled the sea lanes in low-threat settings. Still less did capital ships trouble themselves with the "flotilla" of small craft that plied inland or coastal waters to perform the administrative chores coastal states have to perform. These were gnats. The torpedo and sea mine turned that neat world upside down. New technology endowed the flotilla with battle power — that is, with the capacity to strike at the mighty battle line — for the first time. All of a sudden, naval commanders had to fret about shielding the fleet from small patrol craft bearing mines or torpedoes. The effrontery! Defensive screens, concentric formations whereby lesser ships warded off incoming threats before they reached the capital ship, assumed a central place in naval tactics. The result, concluded Corbett, was a revolution that rendered past methods of designing fleets suspect. Revolutionary times vexed Corbett, an Englishman, because the Royal Navy was a service built around heavy combatants. It was the chief beneficiary of the ancien regime in sea combat. Britain, then, stood to lose the most should rival navies field swarms of small craft that packed a wallop. The U.S. Navy finds itself playing the Royal Navy's role a century hence, with coastal states devising dense networks of anti-access defenses. Corbett's revolution never passed. But now Hughes & Co. urge America, the reigning maritime hegemon, to turn it to advantage in contested expanses like the South China Sea. Interesting; what do you call it when a guardian of the old order embraces revolutionary methods? The coauthors' fleet design remains hypothetical, needless to say. Small craft find little favor in great navies, steeped as mariners are in the lore of big ships slugging it out on the high seas. 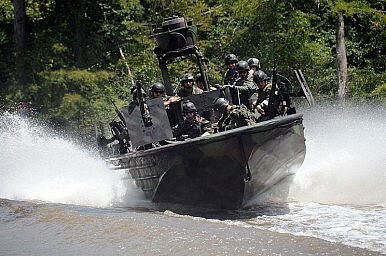 Incorporating fast patrol boats into the U.S. Navy in large numbers, consequently, would demand a cultural as well as a technological revolution. Call it the They Were Expendable effect. Our navy has an ingrained, strongly negative cultural memory of the dismal fate U.S. Asiatic Fleet torpedo boats — the fast patrol boats of the day — met at Japanese hands during World War II. That such reflexes can be overcome is far from certain. They certainly can't be easily overcome. As Assistant Secretary of the Navy Franklin Roosevelt quipped a century ago, the navy is like a feather pillow. You can wear yourself out punching it, only to find out it's the same shape as before. Change comes slowly and fitfully. Undaunted, the coauthors wargamed out a South China Sea scenario, concluding that a force of 24 missile craft resembling the Swedish Navy's Visby or the Taiwan Navy's Hsun Hai — vessels displacing around 800 tons, armed to the teeth with anti-ship cruise missiles, and equipped with onboard sensors to facilitate independent action — could inflict sufficient pain on Chinese shipping to prompt Beijing to come to terms. They could do so rapidly to create a shock effect, dial back the tempo to raise the pressure gradually, or operate in concert with submarines for maximum effect. Maintaining such a capability in peacetime would translate into diplomatic influence — hence the Proceedings article's title. Some questions do linger about all of this, mostly pertaining to politics. Sending ships to Davy Jones' locker is a serious step, going well beyond capturing ships pursuant to a blockade. Under what circumstances would an American president give the order to wage unrestricted surface warfare, and would Beijing escalate in retaliation for such a campaign? A fast-attack-craft fleet, moreover, would have but one, obvious, purpose. What country would agree to host such a fleet, considering the hackles it would raise? Would it be a nouveau Asiatic Fleet based in the Philippines? That'd be quite the historical rhyme. Read the whole thing.